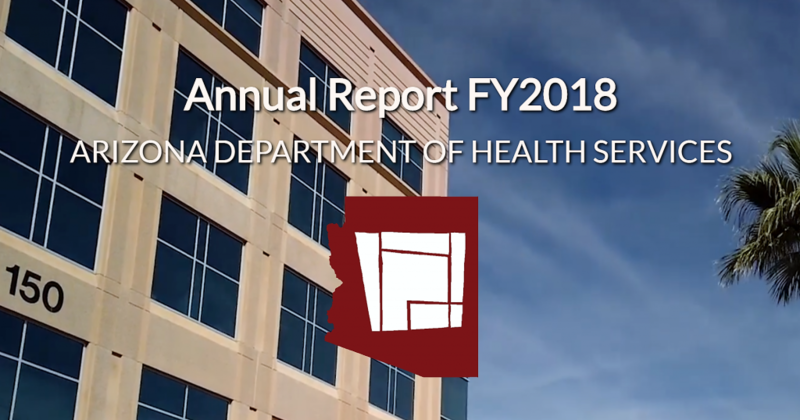 As we wrap up Arizona Public Health Week and National Public Health Week, today we published our Annual Report, which highlights many of the great accomplishments of our agency from the last fiscal year: July 1, 2017 to June 30, 2018. As you will read in the Annual Report, we made great strides in continuing to improve the overall health of our state. As we continue to make progress on the opioid epidemic, in July 2017, the new opioid prescribing and treatment rules for healthcare institutions went into effect, and we launched a new dashboard that gives our partners access to real time data about opioid overdose, overdose fatalities, number of naloxone kits dispensed, naloxone kits administered, and cases of Neonatal Abstinence Syndrome. In September 2017, we published the Opioid Action Plan that provided recommendations, additional response activities, and preliminary legislative ideas to Governor Doug Ducey. Governor Ducey called a special session to address the opioid epidemic on Jan. 22, 2018. A week later on January 26, Governor Ducey signed the landmark Arizona Opioid Epidemic Act into law, which took effect on April 26, 2018. A major accomplishment for ADHS was earning National Accreditation from the Public Health Accreditation Board. National accreditation reinforces the role of the Department as a leader in promoting the health and wellness of Arizonans. In October 2017, we implemented a new death registration and Vital Records issuance system that upgraded the process to be a fully electronic registration system, eliminating faxes, paper, and manual processes. We also launched a bullying prevention campaign in October 2017, and released a new Healthy Kids AZ mobile app in July 2017. These are just a few of the many accomplishments from the previous fiscal year. I encourage you to take a look at our report so you can learn how public health is always working behind the scenes to improve the health and wellness of all Arizonans. You can continue to follow the work being done every day here by subscribing to our blog and following us on Facebook, Twitter, and Instagram. I am proud to lead a nationally accredited, award-winning health department that is served by the most dynamic and dedicated team in state government. Together we are working to promote, protect, and improve the health and wellness of individuals and communities in Arizona.